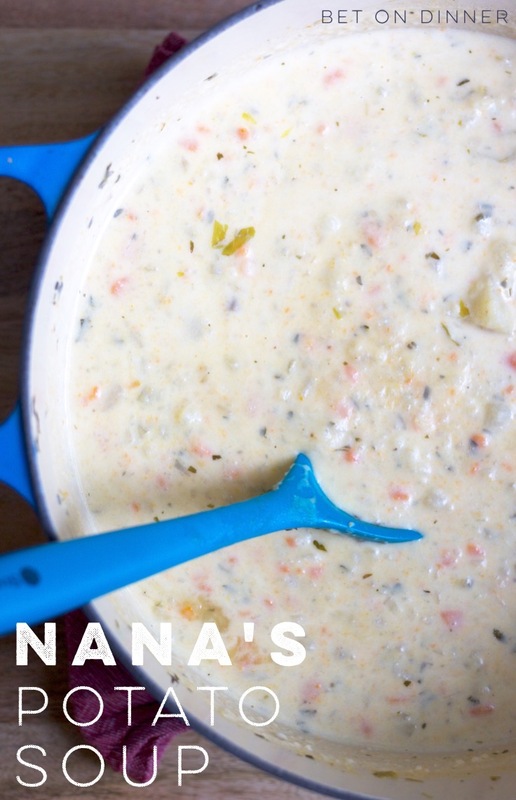 This is my Nana’s potato soup, and it’s hearty and comforting and full of potato flavor (i.e., it’s not a restaurant-style baked potato soup that’s chunks of potatoes in a creamy base…this is potato-y through and through!). I do feel obligated to tell you that my first memory of this soup takes place at the red kitchen table of my childhood. I wasn’t excited about the meal in front of me – what were those flecks of unknown Things? I had been reading a book called Nancy and Plum by Betty MacDonald (which is still one of my very favorites – saying I’ve read it dozens of times is not an exaggeration), in which cruel boardinghouse mistress Mrs. Monday forces the orphans in her care to eat terrible food, like oatmeal with stewed prunes. So I plowed through my bowl by pretending it was my daily portion of gruel. 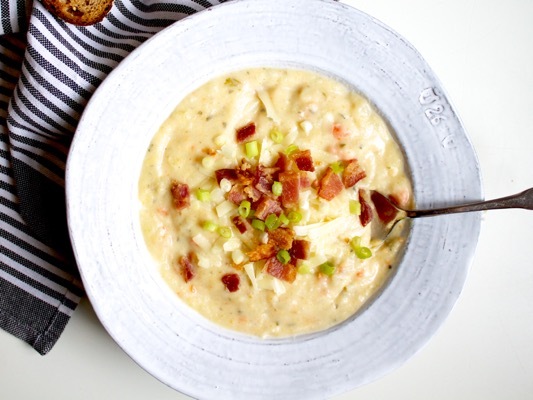 In the process, I discovered not only that there was nothing objectionable about it, but that it’s like extra good mashed potatoes meets soup, and it’s one of my favorite things! It starts with onions and celery and carrots, like many good soups do. Let the veggies start cooking while you peel and cut up the potatoes. Then add chicken broth…or water and one of my favorite products, Better than Bouillon! I get it at Costco and in my opinion it’s the secret to great soup. 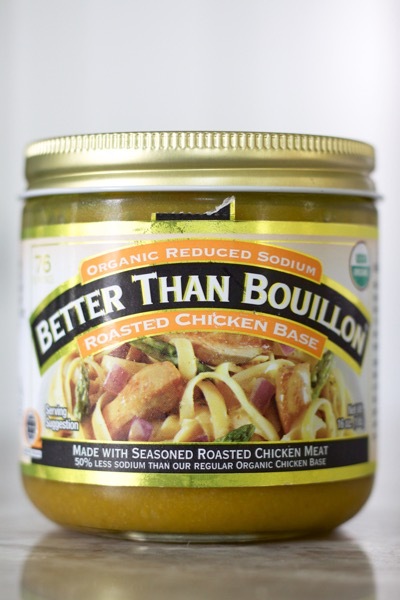 I prefer it to buying chicken broth cartons because it’s much less expensive, creates less waste, allows you to make a small amount if you need, say, 1/2 cup of broth for a recipe…and Cook’s Illustrated recommends it, so you know it’s good! I feel a little silly doing these disclaimers, but this is just a product I love and not something I’m paid to tell you about! 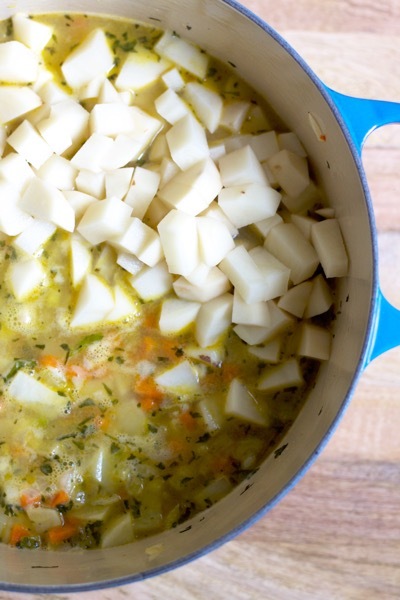 Add some seasoning and those chunked potatoes and let the soup simmer away! I got this pot started during naptime, so I let it cook on low for the afternoon, but if you’re in a hurry the potatoes and other veggies should be tender in about 20 minutes at a gentle boil. Use a potato masher (or your meat pounder-thing if you’re me) to mash some of the potatoes – leave as many chunks as you like! A few minutes before serving, add half-and-half. The recipe calls for 2 cups, but I start with less (one or one-and-a-half). That way, I can taste and make sure I don’t dilute the flavor too much – plus, I like it to be thick! I often add more to thin it back out when I heat up leftovers the next day. 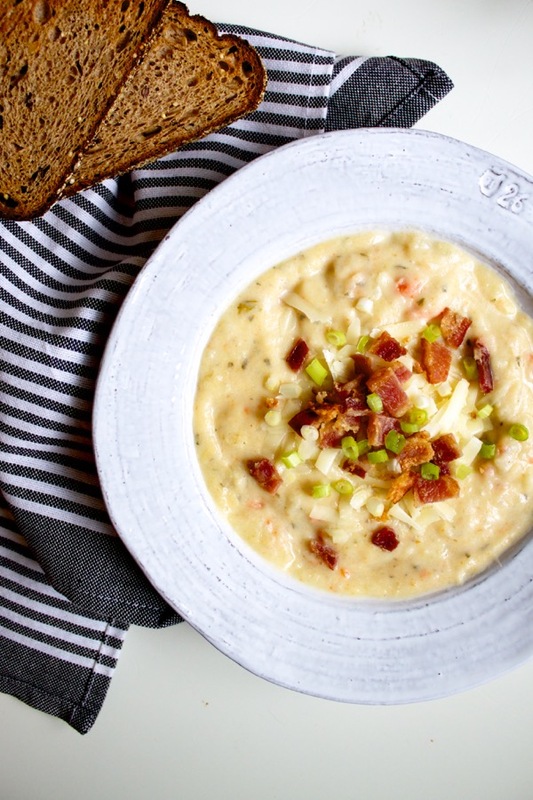 Cheese, bacon, and green onions are (kind of) optional toppings! Heat a large pot over medium-low to medium heat and add butter. Chop onion while it melts. Add onion to pot and stir, then chop celery. Add the celery to the butter and onion and let cook while you peel and cut up carrots. (You want to “sweat” the veggies, not brown them, so stir occasionally and turn the heat down if necessary.) Add carrots, and peel and cut potatoes. Add potatoes, broth, and seasonings and bring to a boil, then simmer, covered, until potatoes are well done (about 20 minutes). Use a potato masher a few times to mash the potatoes and carrots, leaving some potatoes in chunks. Add 1 to 2 cups half-and-half (see note) and stir until soup thickens a little and is hot (do not boil at this point). Top with cheese, bacon, and green onions! I like to add 1 cup of half-and-half to start, and then taste the soup. You can always add more to get the taste and consistency you want! I sometimes add more to leftovers, as the soup thickens over time. I mean, yeah. That’s the rest of the story. I was going for “I’m weird but in a way you can relate to”, instead of totally and completely weird. ;o) Buuuut I’m sure I can only keep that charade up for so long! Luckily we do the non-Cuisinart version now so no one else’s children will be confused about how tasty fish food turned out to be. This is amazing. I made it Wednesday and it was a huge hit for the house – you know, me and Matthew. Thanks. I’ll be making it again. I put it on a real recipe card! Keep it up Bet. You’re supplying me with loads of inspiration. I’m so glad you guys liked it!! Thanks for the encouragement, my dear friend! Ahhh so delicious! We had some friends over and I made this and it was devoured! Definitely will be making it again! Love your ideas- the bean burritos are on the menu for this week. 🙂 Please keep the ideas coming! i love the soup so much. It was pretty quick and easy to make, but also it took some good bonding time with my 10 year old to get the carrots and the stuff chopped up. At the end of the day, it is best soup I have ever made. Thanks for forwarding me the recipe. Wow! I’m so glad you guys liked it, Peter! Way to recruit that lovely daughter of yours! Hi Bet, Mrs.Wolling here. I have enjoyed looking through your blog… Many great recipes which I will try as I, too, love to cook. I am so delighted to connect with the grownup Bethany. I have many memories of you from days at Beverly Heights, and also your lovely Nana. We still hang the stockings at Christmas which she made for us. Keep up the good work with this blog ! Love to your Mom! Thanks, Mrs. Wolling! I know Nana would love knowing you are still using the stockings – we just put ours away, too! :o) You’ll have to let me know if you try any recipes. Hope you guys are doing well and thanks for reading! I’ve been thinking about those crispy onions every time I eat a salad! Good idea as a topping! Made my husband’s top favorite list! Fall is slowly making an appearance here in Michigan, we are about to have a house full of Matt’s pulmonary/critical co-fellows on Thursday and this soup is on the menu! It is one of our favorites and a go-to for filling lots of bellies. Thanks for sharing such great recipes- miss you and your family!!! Oh, yay! This makes me happy! 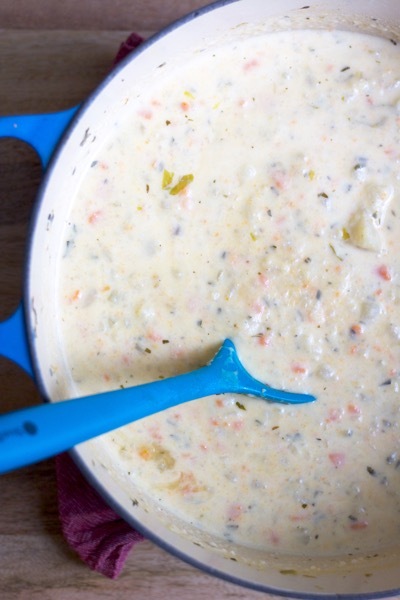 I hope you all had a great night – I agree, this soup is great to feed a crowd. We miss you too! Making this again tonight! It’s currently 91 degrees in the middle of October in Savannah, GA… but who cares. We have been looking forward to “bacon soup” for about 8 months. Deeeeeee-wish-us! Haha love it! We are ready for some fall-feeling weather here in NC too! !